My darling Lil B is one.. my lil B is O-N-E!!! My Lil B turned 1 year old on the 22 January. Exactly a year ago, my baby decided he’s ready to meet the world when my I started to feel the tiny weenyÂ contractions painÂ coming in the middle of my sleep around 2.30am. SinceÂ the painÂ wasn’t really regular, as yet, I brushed it off,Â assuming it was another falseÂ alarm. Afterall, I have been scheduled to go in at 5.30am for induction. I tried to get some sleep before the big day ahead. After tossing for an hour or so, unable to sleep, I went to the washroom only to be greeted with patches of blood. That’s it! My baby was getting impatient and wanted out. So I gathered myself, brushed my teeth, clean up my face, so forth and woke hubby up. He was stillÂ in daze being suddenly awaken from his slumberland. There goes, we zoomed to the hospital and the rest were history. 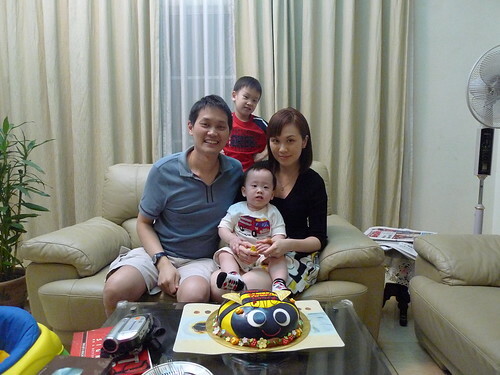 Darren came back from the hospital 7 days later to HOME SWEET HOME. My baby, had gone through so much. Today, he’s a bubbly 1 year old with a cheeky mind. He dotes on his kor kor and will instantly be brightened up when kor kor is around. We celebrated lil B’s birthday a little earlier because we had planned to bring lil B to Singapore on his actual birthdate. It was a private occasion wit just family members. On the 16th January (Sunday), we collected his pre ordered cake from Secret Receipe Sg Long. 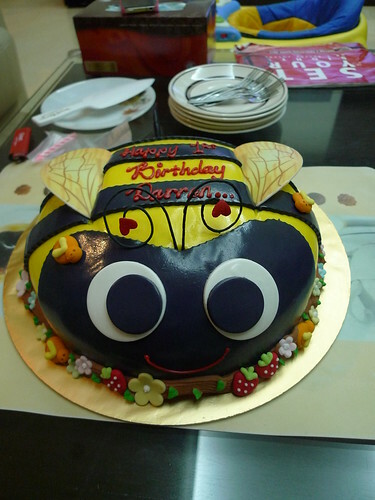 Ryan had chose the cake for lil B. It’s a cute yellow bee cake. If only the taste is as good as its look. 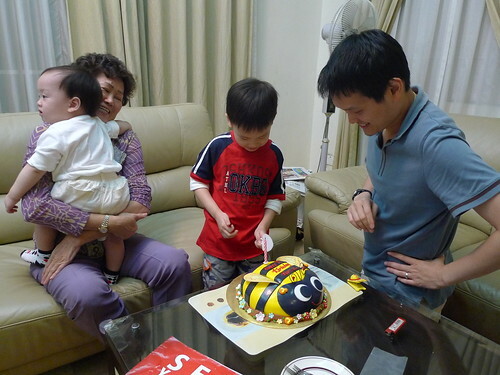 Ryan insisted to cut the cake on behalf of Didi. @ 1 year old +, he could take many little steps. He could walk easily 10 – 15 steps without support. It’s pretty scary to see how he walks. Not knowing anything about danger, he could walk really fast. It’s really scary I could have a heart attack. - He is one loud baby. His screams could be heard a few blocks away. No joke. - He started to have stranger anxiety when he was about 11 months I think. He refused to be carried by anyone except us (luckily not just me). Somehow he doesn’t like to be carried by Loida. It does send me shivers imagining things whether she has been abusing my baby hence the dislike of her. But then again, I am a stay at home mom and so far I am not seeing anything that weigh on my suspicious. I guess a CCTV inside the house is inevitable now. - He’s starting to be more picky on his food. He loves adult food. I must admit, I am less strict on his diet as compared to Ryan’s at the same age. They said 2nd time mom is more ‘relaxed’. I guess that’s true to a certain extent. - His sleeping pattern is good. He normally wakes up around 7am which is the time Ryan wakes up for school too. He will take his nap around 10am for about an hour – an hour and half. His next nap would be around 2.30pm for another 1 – 1.5 hours. Two naps a day. I try not to let him nap past 5pm. So far the schedule works fine and he’ll be in bed around 9pm, latest 10pm. This is so much better than the early days when this little pumpkin will only sleep way past midnight. Those days were torturous. - He’s very scared of the doctor. I brought him in for MMR jab last week (11Feb) and the moment I put him on the scale for weighing, he started wailing. He stopped crying the moment I picked him up. Then when we were called in, he started his antics again the minute he saw doctor’s face. What a drama king. LOL. When we came out of doctor’s room, everybody were looking at us. I’m so sure even the neighbour office could hear his screaming and cries. - On normal days, Darren eats cereal for breakfast. For lunch, he eats what Ryan eats so it can be noodles, pasta, rice. For dinner, he’ll have his regular porridge with pureed chicken, vege, etc. He absolutely loves soup. Any kind of soup goes with him. Happy 1st Birthday to Darren. How time flies ya. Happy Birthday Darren. Welcome to Toddlerhood. Good to hear that ur korkor is taking good care of u.